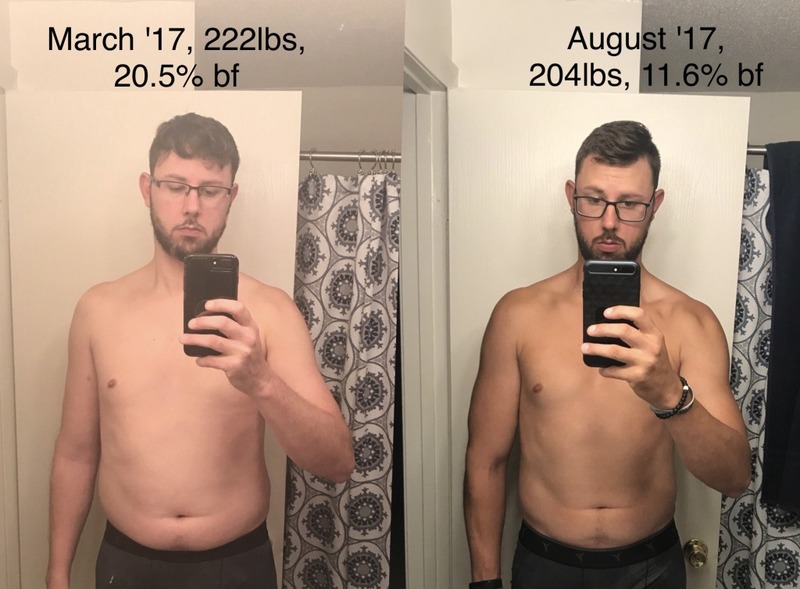 Taken a long time off from this forum, and Fitness in general. Looking to change that. I have been skinnyfat all my life and finally decided that needed to end. in 2013 I went from 230ish lbs down to a record low of 182lbs in my adult life. I then worked back up to 200lbs by adding some muscle. All at PLANET FITNESS! I was even living the 8-pack life, if some of you remember. I was UNCOMPROMISING in my diet. I did leangains. Intermittent fasting. I was in the best shape of my life. Then I went on vacation. Binge ate and drank for a week. Fell off the wagon pretty hard. But stayed in the gym and playing volleyball. Stayed in decent shape. Probably 15-17% body fat and reasonably muscular given my tall lanky size. Then 2015 Came, and along with it, a Broken Tibia. 7 months in a cam walker boot, and a devastatingly awful diet. No physical activity at all. Right back up to 230lbs. Boot came off end of 2015 and beginning of 2016. 2016 was a year of streaks of on and off in the gym. I moved across the state, I was in and out of a relationship. Playing volleyball the whole time, but never staying in the gym steadily. I stayed eating WHATEVER I wanted but got back down to 225. Here I am today, a couple months into a new relationship, and ready to be a beast again. I'm two weeks into a new fitness regimen, and really enjoying it. After probably 4 years of membership, I finally ditched planet fitness. I belong to a beautiful institution called BIG Sky Fitness now. Really nice facility. Cheap. TOP notch equiment and literally ANYTHING you could need to work out. I've ditched my old isolation split workouts (monday legs and shoulders, wednesday biceps and back, friday triceps and chest) for a 3/2 volleyball specific workout. Lots of core workouts on a bossa ball, lots of squatting, deadlifting, etc. It feels AMAZING to be a part of a REAL gym, and I'm endlessly sad I didn't do it sooner. So this is my thread. I'm 32 years old, I turn 33 on March 6th. I stand at 6'5.5'' tall, I weigh 222lbs with workout clothes and shoes on. 19.7% body fat. Lean Mass weight is 182lbs, and I have a 40lbs body fat composition. Looking to be 14-15%, around 200-205lbs. I'm not going to go diet crazy this time. I stick to veggies and chicken, yogurt, cheese, avocado, steak in variations during the week... On the weekends I'm going to live normally. I've cut all non-diet soda, I rarely, if ever drink alcohol. I'm going to stay away from fast food outside of maybe subway or panera. CN: Been out of shape my whole life. Found vball at 27, at 29 decided I was too fat and started to work out heavily for the first time in my life. Went from 230-182, and then back to a healthy weight of 200. Broke my leg at 31, gained it all back (albeit with a better base than I had the first time). Have managed to maintain at 220-225. Want to be 200 again without going super ultra strict on my diet. Finally working out in a real gym, 5 days a week. Ay yo girl, when you gonna let me tap that? sounds good. wondering how you know with such precision your BF%? Dexa? hydro-weighings? Good luck, brah! Stick with it. Heading into week 4 of UCLA's off season volleyball lifting program. Very interesting doing full body workouts instead of isolations. Lots of practical working out instead of just various isolation lifts. I feel great, down 8lbs. Coming up on three months back in the game. I spent month one and two, working out hard while eating however much of whatever I wanted. Then I got back on my diet game, at the beginning of april. High fat, low-ish carb, low-ish sugar. Protein shake (one scoop MyProtein cookies n cream) in the morning as SOON as I wake up, with L glutamine, creatine, and BCAAs added separately (all unflavored, and purchased from BulkSupplements), which I use to wash down Omega 3-6-9 Gelcaps. Then as soon as I get to work I have a Banana and another protein shake. From there I snack on a yogurt or something and perhaps some string cheese. Lunch is typically a salad, chicken breast w. veggies, or a whole avocado, etc. Dinner is typically some variation of lunch. Im super lazy to cook. Result? After 3.5 weeks dieting, I'm down to 213.5lbs and an indicated 14.0% body fat. Still working hard. Would love to see abs by Memorial day. I'm in a good place. My core and trunk strength are WAY UP, all my lifts have increased RAPIDLY, and I feel and look MUCH better. I do not do ANY bicep isolation work (no curls), nor do I do any benching or anything of that nature (bad for volleyball). I am thinking of adding in some stair climber cardio to assist in fat loss. TL;DR: After 3 months back at this, the first two lifting 5 days a week but no dieting, and 3.5 weeks of the same lifting schedule PLUS dieting, I am down 8.5lbs, and (roughly) 6% body fat. Had a caliper measurement done. As of this AM, 211.5lbs 14.7% body fat. Going to up my focus on cardio. Down to 200lbs, but it should be better. Diet has been poopy lately, but I HAVE stayed in the gym. Edit: Had to fix typo in pic above. THanks man Just gotta keep the train rolling. Getting to the gym is very easy for me... The eating well? Less easy.